Pakistan - The Best in 2011-12 and the Best of all Time at Home! Remember what I posted just before the test series between Pakistan and England got underway? This article was all about what the test series meant for Pakistan cricket, and how it was all about showing the doubters that we are not only good at beating lesser sides, but are one of the best test teams around. It still hasn't sunk in that Pakistan have not only won the 2nd test, but also won the series; if that is how I am feeling then I can't even begin to imagine what all those critics and doubters would be going through right now. It is time to wake up and realize what Pakistan have just done. Believe it or not, they are up 2-0 and the prospects of a whitewash are truer than ever. This was only the second time that Pakistan had defended a total below 150 successfully in a test match. The last time was against New Zealand in 1993 when Wasim and Waqar took 5 wickets apiece and Wasim bowled unchanged for 22 overs to ensure Pakistan defended a score of only 127. That's funny because right after Pakistan's innings ended yesterday, my facebook status was "is anyone else dreaming of Ajmal & Co. doing what Wasim and Waqar used to do in the 90s or am I the only ultra optimistic fool?" Guess at times it pays off to be an eternal optimist. The night before the 4th day I was involved in a debate on what kind of target would be a winning one for Pakistan. The general consensus was that a target of 200 was the minimum that was required. Some said, 180 would be a fighting total also. Little did we know that even a lead of 75 would have been enough! And to think that Pakistan managed the impossible and bowled out England for their lowest total ever against us. This was Pakistan's 4th consecutive test win, and it was also their 7th test win in their last 9 test matches. If you extend this run further back to the start of 2011, then Pakistan's record reads: Played 12, won 8, drawn 3, Lost 1. Those numbers give Pakistan the best test record amongst all test playing nations for matches played since January 2011. 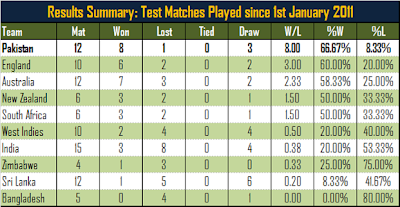 Since the beginning of 2011 till date, Pakistan have won the most number of test matches, have the best win:loss ratio, and have the highest win percentage and the lowest loss percentage, amongst all test playing nations. Is there any doubt then that at present, Pakistan is the best test team out there? Going into this test, Ajmal required 7 wickets to get to a haul of 100 wickets in test matches. And he managed just that many - 7 wickets in Pakistan's epic victory over England. 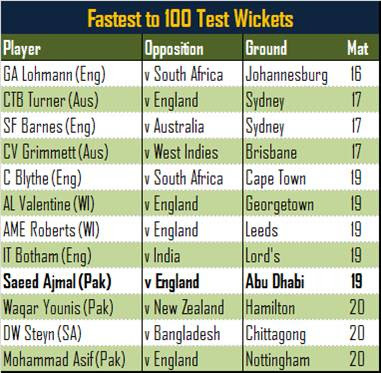 Not only did he pick up his 100th test wicket, Ajmal also became the fastest Pakistani player to get there in 19 test matches - 1 less than Waqar Younis and Mohammad Asif. Ajmal's feat - 100 test wickets in 19 tests - puts him along side legends like Ian Botham and Andy Roberts. No one has got to 100 wickets as fast as Ajmal has since Botham did 35 years ago. Traditionally, Ajmal has been Pakistan's match winner while Abdur Rehman's role has been to stop the runs. Rehman has bowled long spells in the past without getting many wickets; but he has bowled long economical spells and has troubled batsmen frequently. What he does at one end also plays a factor in the opposition losing wickets to Ajmal. But yesterday was Rehman's day. He finally shone and exploited the rough created by England's and Pakistan's pacers to full advantage. It was only Rehman's first 5 wicket haul in test cricket and what a day to achieve that. If you take a look at Rehman's test record, it doesn't look much different to Ajmal's. Both their averages, strike rates, and economy rates are very similar. They also have the same number of 4 wickets hauls. It wouldn't surprise me if Rehman joins Ajmal as the fastest Pakistani to get to 100 test wickets. While the UAE might not be home to Pakistan, they have played most of their cricket here over the last 18 months and they remain unbeaten in a test match in both Abu Dhabi and Dubai. Who says it isn't home here for them? Pakistan have always favoured home conditions and have always done well at home. 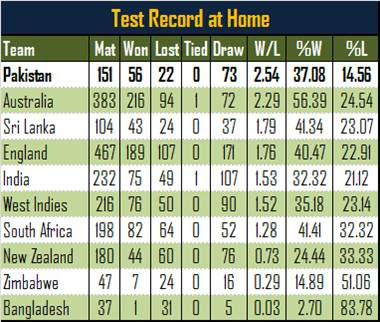 But its strange then that despite having the best win:loss ratio of all time amongst all test playing nations for test matches played at home, no one really thinks of Pakistan when you think of test teams that are significantly dominant at home. I mean, beating India in India or Australia in Australia is considered the final frontier for many teams. At one time beating West Indies in West Indies was also considered a huge feather in one's cap. These are feats not many teams have achieved. Yet, despite all this hype, it is Pakistan that turns out to be the strongest team at home! Soon, beating Pakistan in the UAE will be one of those frontiers that teams would want to achieve. For England, that challenge comes around next week. Tell me whose not already thinking of a whitewash! Hmmm...Pakistan and Australia good at home historically. Aside from the players & conditions, what other factor could have possibly influenced matches in these 2 countries throughout history? Interesting thought anon.. but besides conditions I can't think of anything else. Half the test matches played in Pakistan have ended in draws so that points to dead pitches.. winning on dead pitches is an art that not many teams have - u either need deadly reverse swing or very good spinners, which Pakistan have had in the past. That's why opposition have found it hard to win there. Australia, well goes without saying why. But besides players and conditions - no idea why they might be better than other teams at home. Australia are not just good at home, they are good everywhere.